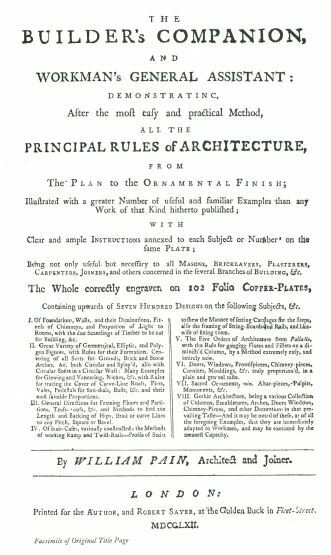 A vital impetus was given to architecture in the eighteenth century by the number of British architectural hand-books which appeared. The accepted manner in England was soon echoed in America and the master builders and designers here manifestly looked to the English pattern books, published and republished since 1700 for their designs of moldings, cornices, entablatures; for portals and even for facades. A careful examination of these early works would seem to indicate that they were not such complete guides as to leave no need for creative ability on the part of the individual who used them. They were, with rare exceptions, merely books of "the orders" and were not manuals of English architecture. This book by William Pain contains tons of wood plans and drawings on proper English style moldings that were in vogue during that time. Perfect for someone who wants to restore an old home and wants to do some old style moldings by hand.